So recently I saw this product on Pinterest. Some lady was showing how it cleaned up her white dishes really well, they had marks all over them from her silverware. I immediately thought of my white porcelain sink. And the AFTER!!!! NO this is not a brand new sink - it just looks like new again! I was so excited - don't you just love a great cleaning product, especially when it doesn't require a lot of elbow grease to make it work. This stuff was so fast and easy! It was like the day I discover the magic eraser - that was such a great day! I have always liked a plain white traditional porcelain sink but always hated the one draw back - the permanent (or so I thought they were) black marks that appear when metal objects scrape it. When I showed my husband he said - "have you never cleaned the sink before?". I just laughed. Every other time I have cleaned the sink (in over 10 years of owning homes with porcelain sinks) everything has cleaned up great EXCEPT those black marks so I always figured they were permanent and I always tried to be so careful when washing metal objects to try to not let them scrape. Apparently the stuff works great on stainless steel sinks and metal cookware too (I'm sure there are a lot of great uses for this product). It is like Liquid Magic! Nice that some of the time I have wasted on Pinterest has now paid off!! OH! it is the best cleaning product ever! I found it a few months ago, thanks to a coupon for it and ladies telling how great it was. We bought a house with 1200 sf of ceramic tiles, but the grout in them was brown of dirt...I used Bar Keepers Friends and a brush and they looked white and super clean after. I re sealed the grout and the floor just looks impeccable. Also for washing pots and pans is way better then Ajax. WAY BETTER! Awesome! I'll have to give it a try! Thanks for the tip, I'm going to have to buy this! I went out looking after I saw this last nite-I have a white porcelain sink too that one of the kids put a cast iron skillet in and let it sit for a whole day and of course it rusted horribly-I couldn't get the stains out no matter what I used-I tried everything on the market-this was three years ago-I couldn't find the liquid but found the powder so I tried it last nite-my stains and scratches are gone!!! finally--thank you so much for sharing this product-I an no longer ashamed of my sink!! I'm so glad it worked - after 3 yrs! Yeah! How funny! I bought this last week on a whim while I was perusing World Market. My sink looked similar to yours and it looks amazing now! I can't believe I just looked at your blog and saw a post about it! Awesome! i will have to get that asap. i have stainless, and they are a mess. 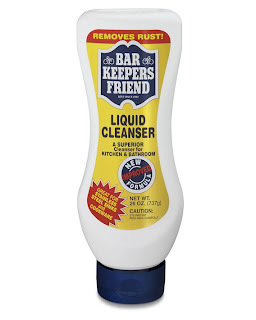 I actually had a man that repairs chips in cast iron sinks use this in the good side if yhe sink. It looked like new. I was amazed. I've seen this a few times on Pinterest too, but it wasn't until I saw your post that I finally went out and bought some for $2.50 at Lowe's. My white sinks look amazing now. My kids thought it was a magic trick. Thanks so much! Can you use it in showers? Trim work - 3 times as fast and 3 times as easy! Master Bath Toilet Room Transformation!